QUEEN’S FILM THEATRE AT 50! A longstanding pillar of the Northern Ireland arts community is marking its 50th anniversary. A long way since it started life in a University lecture theatre, Queen’s Film Theatre (QFT) is now an integral part of cinema culture in Belfast and further afield. QFT’s twofold mission has always been to provide a unique cinema experience and to create and widen access to the best of film from around the world. From its early and modest beginnings in an English lecture theatre at Queen’s University right through to the present day one thing has remained consistent at QFT – a commitment to bringing great cinema to the people of Northern Ireland and Belfast in particular. Established in 1968, Queen's Film Theatre has become the living breathing culture capital of Belfast, paving a unique pathway unlike any other independent cinema across Northern Ireland. A place of serenity for film fanatics it has also played host to many well-known visitors including Daniel Day Lewis, Lord Attenborough, David Lynch, Lord Kenneth Branagh, Stephen Rea and Ken Loach to name just a few. A £350,000 refurbishment of Screen 1 marked the beginning of an exciting year for QFT as its golden anniversary celebrations got under way at the start of October. Speaking recently, Head of QFT Joan Parsons said: “This is an exciting and significant year for QFT. October marks the Theatre’s 50th anniversary and we are delighted to refurbishing Screen 1 ahead of its ‘golden’ anniversary. The refurbishment of Screen 1 included new luxurious seats, the installation of an advanced sound system and a freshening up of the main foyer and toilet facilities. The month-long celebrations include a complete digital archive and exhibition of QFT brochures from the last 50 years which will be followed by a tour across Northern Ireland to bring the rich heritage of QFT to a wider audience. The QFT 50 festivities have been supported by National Lottery funding awarded by the Heritage Lottery Fund and The British Film Institute (BFI). Angela Lavin, Senior Grants Officer, Heritage Lottery Fund Northern Ireland, said: “We are delighted to fund this fascinating new project which will draw out the stories of the QFT and its 50 year history. “The project will bring this collected heritage to a wide range of audiences and provide opportunities for learning, enjoyment and skills development. 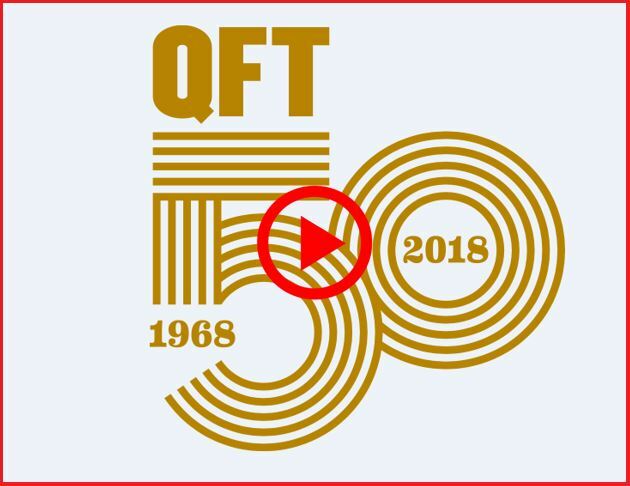 Sarah-Jane Meredith, Manager- UK Wide Audiences, at BFI said: "We are delighted to be able to support QFT as it celebrates 50 years of screening films to audiences in Belfast. “The QFT50 programme demonstrates an ongoing commitment by the venue to screening the very best in cinema, bringing great cinematic stories to new and existing audiences and re-kindling a love for cinema in lapsed audiences." During October QFT is hosting a season of screenings, special events and talks that takes a look at QFT past, present and future. And there’s a series of exclusive previews giving the QFT audience a first-look at some of the hottest upcoming movie titles. There will also be a chance to see again some of the most successful films shown at the Theatre since 1968, plus QFT programmers have cherry-picked some of the finest titles from around the globe as part of QFT Selects. 14 October Bloodyminded – First ever interactive live feature film broadcast online and at cinemas around the UK. The film will allow audiences to make its own decisions on the morality of war and decide the ending. 16 October Themed 50th birthday celebration night with screening of Viva Marial, followed by a David Holmes DJ set. 19 October Devils Doorway – Gala screening with director Aisling Clarke (former employee of QFT and first ever female-directed horror movie). 21 October Mark Kermode book launch and Q&A. 31 October Closing Night Gala – Widows by Steve McQueen with special guests to be announced at a later date. With the celebrations well underway – and several special events and screenings already sold out – the 50th Anniversary is guaranteed to delight fans from far and wide and may even draw in some new patrons to sample the magical QFT experience. If you would like to support the QFT Adopt-A-Seat programme contact Meaghan Lyons, Regular Giving Manager or visit https://daro.qub.ac.uk/adoptaseatatqft. For QFT media opportunities please contact Stephen O'Reilly, +44 (0)28 9097 1195. For more on the latest films being shown, visit the QFT website. General enquiries to Gerry Power, Communications Officer, Development and Alumni Relations Office – tel: +44 (0)28 9097 5321.